You know in “You’ve Got Mail”, when Meg Ryan has the “Shop Around The Corner” and she sees herself dancing around? Well, I’ve dreamt about having a shop for years (and I know it’s only 500 square feet) but it’s really special to us!!! I think it’s really cool that you can just walk in and feel like that you’re in a home that we designed and take a little piece with you. You can watch the webisode, and see how we celebrated with an opening party! The beautiful flooring is by Warren Christopher. It's light, but still feels warm and welcoming. 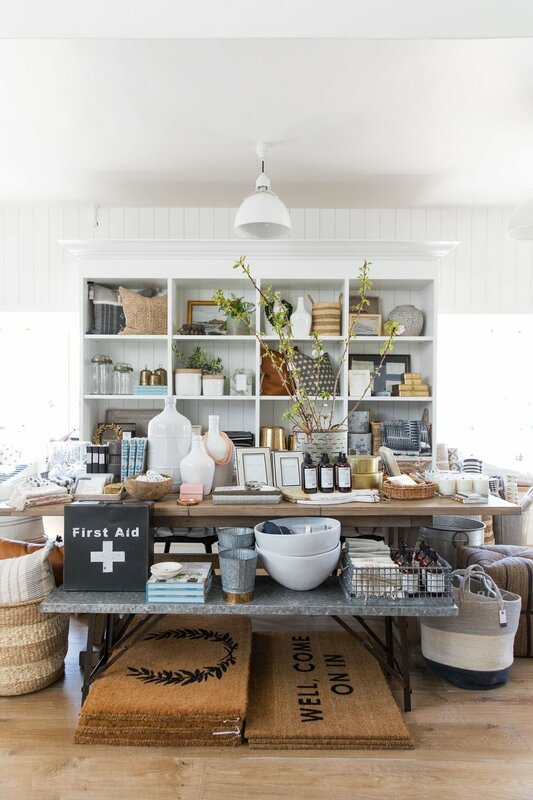 We used white vertical shiplap by Metrie and it really set the tone for our beachside shop. 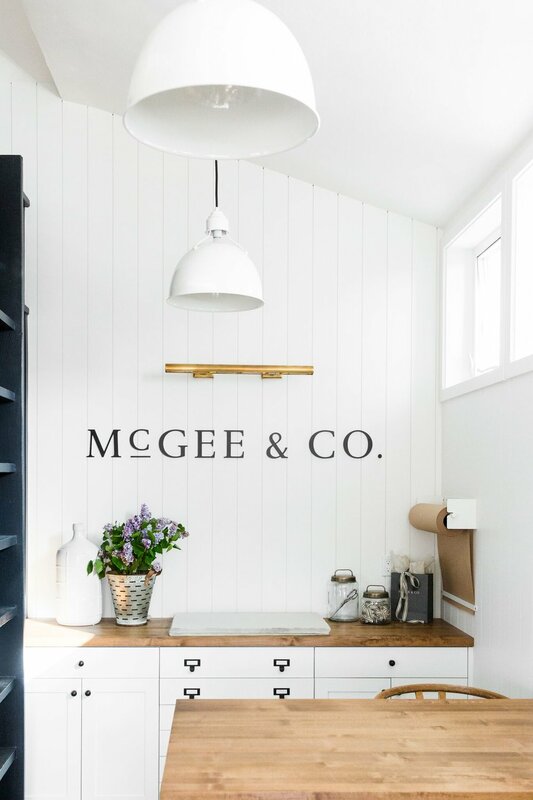 The rest of the space is painted in one of our go-to's, Simply White by Benjamin Moore. We have Eugene Pendants in our studio, so it only feels right to have them in the shop, too! The cash wrap area used to be a tiny office behind a barn door, but we needed the extra space and a focal wall so we opened it up. 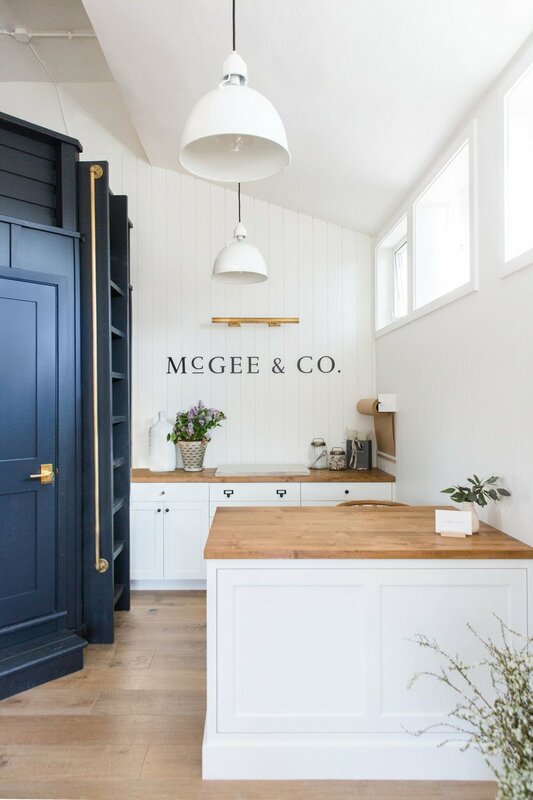 The McGee & Co. sign turned out exactly how I imagined it. Initially we toyed with the idea of decorating around it, but I knew in my heart it needed to be clean and simple. The 24" Cabinet Maker's Light was the perfect solution to fill the space and draw attention to the sign. 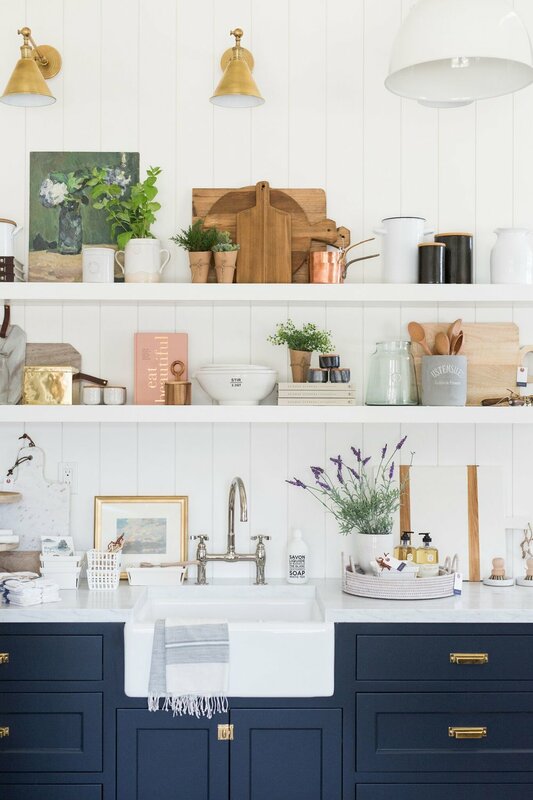 The countertops are By Jeff Allen from Bearhorn Design, and the small details like the wall-mounted butcher paper holder really make this space feel like a shop. I went back and forth a lot about how to lay out the shop. I'm so happy about how we have utilized every square inch. One of our top sellers, the La Pergola Extension Table runs down the center of the shop and is filled with decor. It's natural and versatile which makes it easy to change out displays. You always need a front doormat, so we made sure to stock up! The kitchenette has a white carrara slab from Bedrosians. It has subtle veining and a classic look that is great for highlighting our products without overshadowing them. You know I love an apron front sink! It only felt right that the shop should have one. 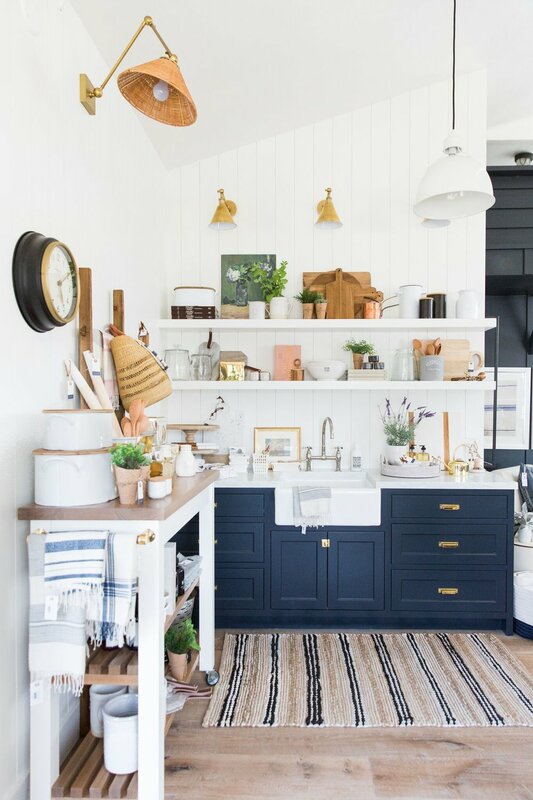 The farmhouse sink and faucet are from Kohler. There are a lot of brass details in the store (like the Boston Single Arm Sconces), so we went with a polished nickel finish on the faucet and couldn't be more pleased with how it pairs with the sink. The cabinet color is "Raccoon Fur" by Benjamin Moore! And of course, a runner. This one will do! It was impossible fit all the product in the shelves so we designed this awesome custom bar cart and had Millbrook Furniture build it. Don't give up the ship! 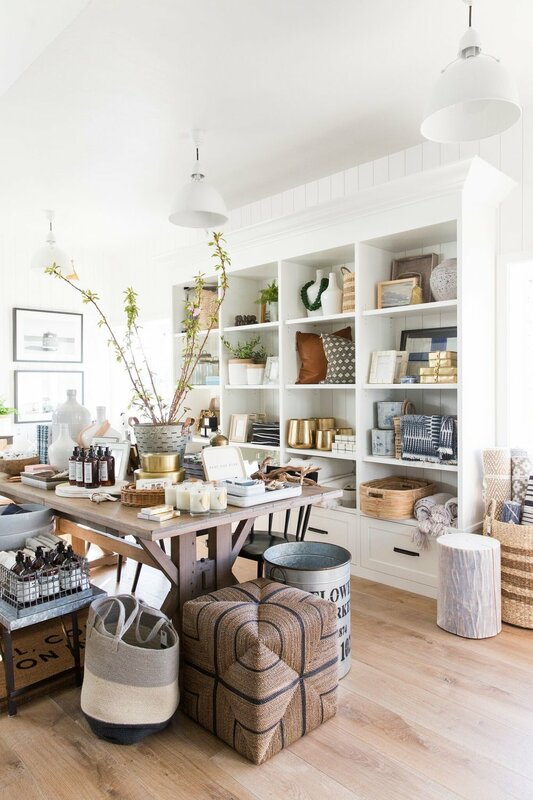 Pair that with the shiplap and the beautiful photo of St John, and it's like you're actually at the beach ;) The woven rattan in the console complements the other woven pieces scattered throughout the shop. It's hard to see in the photo with all of that glorious sunshine, but the Vintage Wagon and Locals Only photographs bring a an old school beach vibe feel to the space.